Vanuatu Kiōng-hô-kok (Bislama-gí: Ripablik blong Vanuatu, Eng-gí: Republic of Vanuatu, Hoat-gí: République du Vanuatu) tiàm-tī lâm Thài-pêng-iûⁿ, si̍t-bîn sî-tāi ê kū miâ kiò chò Sin Hebrides. 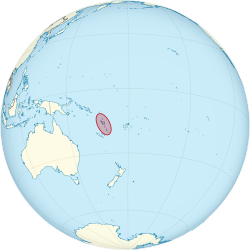 Hù-kīn ê chèng-tī tan-ūi: New Caledonia (sai-lâm, 500 km hn̄g), Fiji (tang), Solomon Kûn-tó (sai-pak), Ò-chiu (sai, 1750 km), Papua New Guinea (sai, 1750 km). ↑ Selmen, Harrison (17 July 2011). "Santo chiefs concerned over slow pace of development in Sanma". Vanuatu Daily Post. 29 August 2011 khòaⁿ--ê. ↑ "2009 Census Household Listing Counts" (PDF). Vanuatu National Statistics Office. 2009. goân-loē-iông (PDF) tī 5 December 2010 hőng khó͘-pih. 6 January 2010 khòaⁿ--ê. 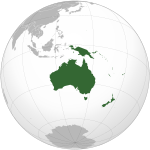 ↑ 5.0 5.1 5.2 5.3 "Vanuatu". International Monetary Fund. 22 April 2012 khòaⁿ--ê.
Chit ia̍h siāng bóe tī 2017-nî 12-goe̍h 2-ji̍t (Pài-la̍k), 09:06 ū pian-chi̍p--koè.